This Unisex "Just Code It" Custom White Short Sleeve T-shirt is made with a breathable and lightweight 100% cotton fabric blend. Available in 5 sizes: Small, Medium, Large, XLarge, XXLarge. Made with Swarovski crystals, these hoop earrings are a great way to glam up your outfit. These earrings are a tribute to the women who pioneered computer programming. Ada Lovelace & Grace Hopper are two of the many trailblazers worth noting. Handmade with 8mm Swarovski pearls & Sterling Silver wire, this piece is classic & timeless. "I like to learn. That's an art and a science." Handmade with velvet & silver plated wire & clasps. Fun Fact: If you open up the case of the original Macintosh, there are 47 signatures there, which are from each member of the Apple’s Macintosh division in 1982. I get a ton of questions regarding the coding books I read to my 15 month old son, specifically on my Instagram. 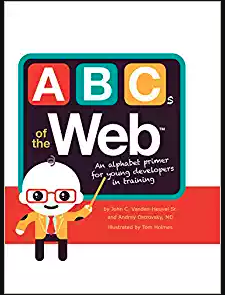 A great introduction to basic coding and web concepts for children in the form of the alphabet! I recently passed the AWS Solutions Architect Associate Exam and would like to share some of the resources I used to study for the exam. I used 2 different online courses to study, did the labs included with those courses, & took a few practice tests. Binary is an ON or OFF counting system, all or nothing. ‘1’ represents ON, ‘0’ represents OFF.